Yo, Welcome to my WoRld yall! Yo, Whud up, This is my WoRld! 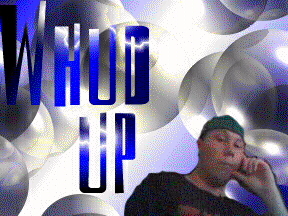 YO, Whud up, this is my sweet up Page! check it out! On my Page i got 2 bands and one crazy a$$ cracker! Tha bands are my two favorite bands in tha world so far! Tha First one is KoRn! I love these guys man! they influenced my life ever since i saw them live in state college! They rocked man! The 2nd band that has a hold of my ear is tha sweet up Limp Bizkit! I heard these guys when i was in tha 7th grade, my homie shane brought tha CD to my piece and we cranked tha s&#t till our ears bled! it was sweet! and tha Crazy Cracker i'm talkin about is Slim Shady! or for yall that just are dumb, Eminem! HEs kool, i got his CD tha first day it came out, and i am still listin to it and still buggin out on it! But i got all them on it! I got their bios, i gotz sound clips, hell i got pics, and even lyrics! so check tha stuph out and oh yea, please, please, please, sign my guestbook when ya are hear, thanks, keep it real, later! Yo, whud up, check my world out!